In case you are sitting there wondering how you’re going to spend your Sunday evening, then Cardinals fans, I have your answer. Say no to your significant other and their pandering for the Army Wives season finale. DVR Big Brother. Skip whatever else the networks are jamming down your throat. Tonight, at least for Ball State football fans, there is only one option… Football Night in America on NBC. Normally, I would rather watch two urinal gnats consummate their union before suffering through a preseason NFL game, one that will of course be dominated by an old man who has no business anywhere near the NFL. Of course, Peter King has to work somewhere I guess. ZING! Seriously though, tonight’s broadcast will be overwhelmed by Brett Favre, who of course came back to football, shocking no one, infuriating even more than were pissed last year after the Favre dog and pony show. No, we aren’t making (or even recommending) you watch to see Favre’s loose skin and old man balls or Peter King’s subsequent washing of those low hangers. 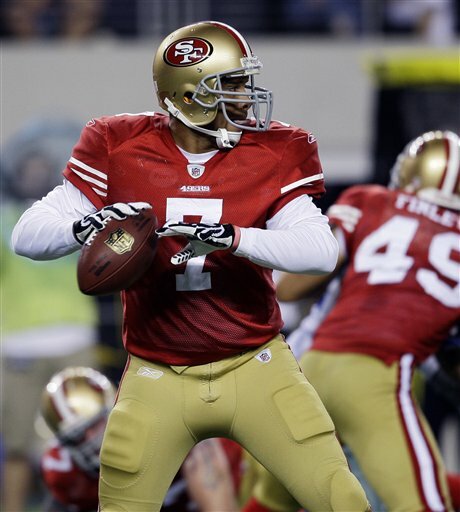 Watch with purpose, and that purpose has to do with the Vikings’ opponent tonight… the San Francisco 49ers, who happen to have one particular player wearing #7 that matters to all of us. After watching him suffer in a 3rd string role all of last season, tonight may very well be the coming out party for Nate Davis, as the 9ers have announced that he will see significant action with the 1st team from the start of the game. Exactly how much Davis gets used, and in what format in terms of time or series, hasn’t been released, but Nate’s finally getting a shot to shine. National television, first teamers, in a game where many many many people will tune in just to see Favre. Here’s his chance to show the people focused on the past just who is the future, and OTP wishes him well as this opportunity unfolds. Make us proud, Nate, we know you will. There’s a large portion of the fanbase who believe in Davis. Another equally large portion who don’t. He’s got the chance to turn some heads tonight, or cement people’s opinions good or bad.